So said Nurse Pat Murphy to Dr Jessica Zitter – just as Zitter was about to plunge a syringe into the neck of a patient with a host of health issues. Tho the 911 call wasn’t made, it was a turning point for Zitter – who trained as a critical care doctor, and for whom going gently into that good night felt like she was abandoning a patient, a failure. That encounter with Nurse Murphy led her to completely change her own medical ‘mandate’ – becoming a Palliative doctor – the specialty that embodies the philosophy of ‘patient-centered’ medicine. 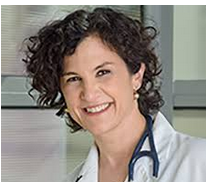 I first ‘met’ Dr Zitter in a New York Times essay in which she admits on her first night on call as a Palliative doctor she hadn’t yet completely relinquished her ‘critical care save the life at all costs’ ‘tude. Luckily for non New York Times readers this essay is in Extreme Measures, the highly readable book Dr Jessica Zitterr managed to fit in between advocating for patients peaceful death, participating in the Oscar-nominated short, Extremis, and caring for three children. The book is a treasure trove of ‘case studies’ to help put into perspective the complexities of emotions of end of life and life-prolonging decisions, along with the simplicity and peace that can come with ‘letting go’. In story after story, we meet patients, their families and the complex patchworks of healthcare professionals who step in and step out. Zitter also explains – in layman’s terms – life-prolonging procedures and interventions and repercussions of same. The context of patient stories is a gift. But Dr. Zitter doesn’t stop there. She takes pains to ensure an understanding of ‘what then?’ ­– after the breathing machine, after the feeding tube: those decision points are equally emotional and stressful. It’s neither pretty nor dignified and often painful and futile. And that’s exactly the message she knows we – and our ‘decision makers’ – need to understand. 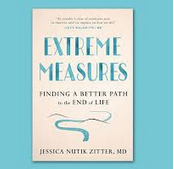 Jessica Nutik Zitter was born to be a doctor – that much is clear right from the start of Extreme Measures. That she’s become an advocate for an end–of-life that is not unduly and painfully prolonged by modern medicine is a tribute to her heart and soul.